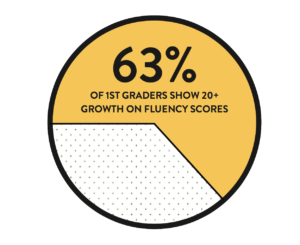 Students were leaving primary grades without the literacy skills necessary for academic success. Teachers did not have a reading curriculum with aligned strategies and materials to support reading instruction for a linguistically diverse student population. Shared reading strategies and collaborative class culture to foster student literacy skills and a love of reading. New classroom practices enable targeted individual growth, peer support, and collective class progress. Students develop an enduring identity as readers. All students participate in shared reading strategies; each child can participate and feel successful. Classroom interventions were consistent each day and became a core component of classroom culture. The Henry Elementary School design team tackled the issue of literacy development in 1st and 3rd grades. Henry has many students who are English language learners that need additional reading support. The primary grades literacy team aimed to build student confidence and a love of reading to motivate all students to become lifelong readers. The school design team took a two pronged approach: individual student support at the appropriate challenge level and strong classroom culture. Students in 3rd grade grew from the beginning of the year to middle of the year, but only 33 percent of students met their winter growth goal. In the spring semester, the school design team implemented the new shared reading experience, centered on a daily whole-class reading followed by tiered, di erentiated support for individual students. Once the practice became an integral daily part of the 3rd grade classroom, students made significant growth. 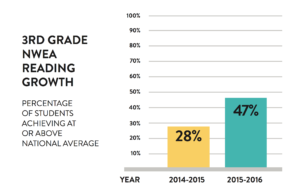 At the end of the year, 65% of third grade students met their end of the year growth goal. As the culture of collaboration and love of literacy was enhanced throughout the school year, so was the collaboration amongst teachers. Teachers collaborated on assessments to measure student growth and understand trends across classrooms. 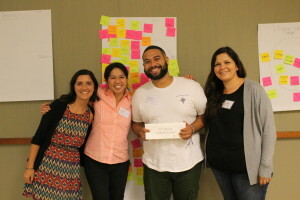 The TrueSchool Team supported the Henry design team to create practices for data management and teacher collaboration that would be sustainable and contribute to significant impact. Common, timely, and relevant literacy assessments optimized the time spent among grade level teams talking about literacy instruction and achievement. On a weekly basis, teachers analyzed their classroom data in comparison to the other classrooms and discussed instructional methods or tactics that led to greatest student growth. The learnings in each classroom were shared to shape instruction for maximum student impact across classrooms. Much literacy instruction is personalized and individual to each student; as a complement to that style of learning, students enjoyed and valued this shared literary experience. The structure for daily implementation was standardized across classrooms, but provided a significant level of teacher choice and autonomy to ensure the methods of delivery felt authentic to each teacher’s leadership style. Additionally, the practices were broad enough so that they could work with any text appropriate for kindergarten through third grade students. This balance provided teachers with a structure to leverage balanced with the freedom to adapt it to their students’ needs. The Henry design team learned that changing attitudes and building culture are very important steps toward knowledge and skill development. Henry scaled their solution in 2016-2017 schools year and it is now a component of all literacy blocks in first through third grade. They further developed their approach to developing student identity as a reader, by incorporating student agency into their unit plans by surveying students about their interests and creating literacy units around those high interest topics. Their work with TrueSchool helped build the foundation of vertical and horizontal literacy skills to create a scope and sequence for the primary grades, and stemmed the creation of concise and common assessments, which has impacted primary instruction in a profound way. Because of these common assessments, teachers are finding unit planning, collaboration and responsive instruction easier and more cohesive. In response to their commitment to innovation and demonstrated initiative, Henry received the Breakthrough Schools grant, receiving additional funds to expand personalized learning and create high interest units of instruction, inspired by their work around student identity as a reader. Henry School is an ethnically diverse, multicultural urban school serving the Old Irving Park and south Albany Park communities of Chicago. We strive for excellence in teaching for all our students. Henry School partners with universities and organizations to bring enriching academic opportunities and resources for teachers, students, and parents. Henry serves 642 students in grades Pre-K to 6.